Something about the opening scene with Catherine Keener rubs me the wrong way. I think it's the dialogue...For some reason parents, speaking to each other when they're alone together, referring to their kids as "our kids" felt unnatural. Not referring to the kids by name, and not "the kids," but "our kids"...It seemed like, "You and I have kids, as is well known by both of us." Of course that's the smallest of nitpicks though. I really enjoy the movie as a whole. Disregarding Hanks' accent and super-regarding the final scene, it's a great dramatic performance. 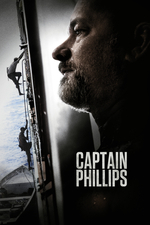 It is a good performance, and I enjoyed the film immensely, so I was sorely disappointed when I found that the real Capt. Phillips ignored warnings not to go within a certain distance of the coast, which he did anyway to save time on the shipping. That bit of knowledge seriously reduced the amount of sympathy I had for him, and even had me wondering briefly how much money the government should spend saving someone from his own pigheadedness (an unfair question, to be sure, given that his crew were also at risk and had no hand in that choice). It's been awhile since I saw this, so I can't remember: how did they convey to the hidden crew that one of the pirates was barefoot? Was it some cultural reference the pirates presumably wouldn't get, like saying over the radio that Joe Jackson was no longer on deck? A good companion piece to this film is the Danish Kapringen (A Hijacking^) (currently streaming on Netflix). In many ways it acts as a counterpoint to the star-driven approach of Hollywood filmmaking. It does have a protagonist, but crucially, he is the chief of the shipping company (there is a secondary protagonist on board, an affable ship's cook). The depiction is not heroic, but does show both how economic pressures lead these companies to take risks with their crews. johnofjack, there's also a key difference in the way (as shown in the Danish film) that Europeans and Americans handle these hijackings. For the most part, the Europeans eventually pay some ransom, but there is strong pressure for Americans not to, necessitating a rescue. Phillips worked for Maersk, but the Alabama was a US-registered ship, which altered the dynamic from an American standpoint. I found Tom Hanks’s character a disappointment in this film. The stilted dialogue at the beginning was a bad sign: “things are changing so much… Companies want things faster and cheaper.” It’s named after Phillips, but he’s such a human suitcase throughout. He is a victim of trauma at every turn, dragged from boat to boat, and finally regains his freedom after closing his eyes during some G.I. Joe sharpshooting. Barkhad Abdi’s character is the real protagonist here.